These are not my reviews just some of the reviews i found online... I will post my review as a comment below these reviews. Please feel free to leave your review of entropia universe as a comment. Project Entropia has been an ever updating game since 1995. It will have continued updating every month, and this game is free if you want it to be. You don't have to pay any monthly bills to keep playing this game online. It's all free if you are willing to work harder, but you can deposit money into the game which will make the game progress much faster and make everything much easier. The money in the game is called PED's (Project Entropia Dollars). These PED's can also be exchanged back into real money (yes, it does sound like a plan to make money off of a video game doesn't it?). The game is like other MMORPG's, you start off with nothing, build your way up, level up in many different categories. You first collect sweat which is a measly way of making money but it's one of the few choices you have. You can also be a runner for a hunter who needs some distraction on the animals that they hunt. There are many things you can do in this game, you can become a Mindforce user, a Hunter, a Tailor, or a Miner with sub-categories within each of them as well. The object basically seems to be that you HAVE to make money. There isn't an exact story to this game but, it is still building it seems. There are animals, creatures, mutants, and robots that co-exist in this world alongside the humans. Some humans are a part of a society or protection force that helps protect others by battling robots that attack. There are alarms in some forts and cities that will go off if there is an attack, but I have not experienced this yet. This game is mainly based around what you want your character to be, and what you want to do. In the end, everything comes back to how you make money. The game's video quality is actually quite good, it needs a video card that can support DX9 or is fully compatible with it. It is in 3D like Everquest, and I think the graphics are really close as well. The music in the game can be sometimes monotonous or just annoying, but you can go to some bars in the game and choose which songs you want to hear from the game. The graphics are pretty good, but many games now surpass it. Of course, like all other MMORPG's, this game's replayability is up there, as long as you have the money, but you could play forever and still not complete what you were set out to do. You get one Avatar (character) per account. This game will eat up a lot of time and if you don't have it, don't plan on getting very far very fast. You will get addicted to this game and eventually, feel as though you have to deposit money in. Again, this game is all about what you want to do with your life inside this game. Everything is your choice if you have PED's. I think that this game just tries to scam you out of your money. I have heard many things about how long it takes to actually take money out of the game. I have also heard things where people who have made over $10,000 on the game, weren't allowed to withdraw the whole amount but only a fraction of it. This game is good and all, but it it's too much about money, that people start turning on other people because of it. If you like money and have always thought of yourself as an entrepreneur, then this game is for you. Otherwise, find some other online RPG even if it means paying monthly. 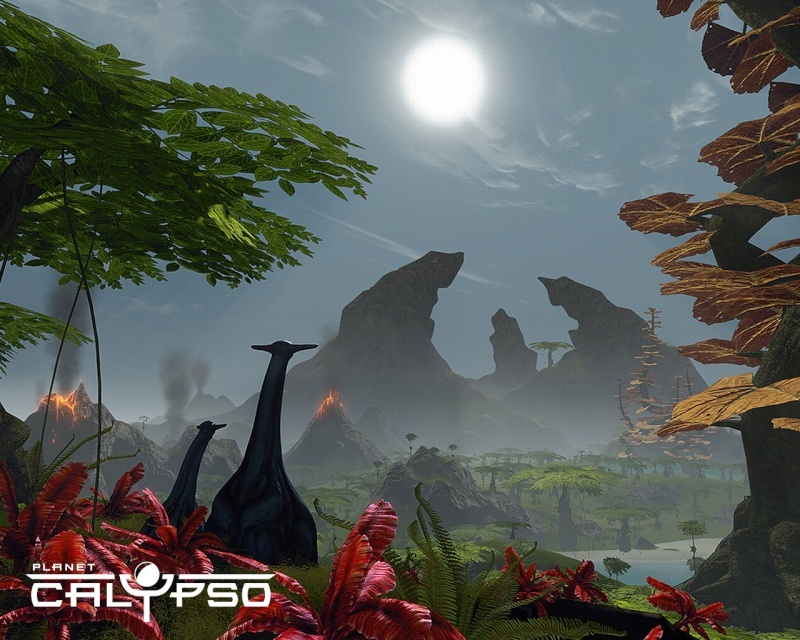 Landscape – Planet Calypso is designed in CryEngine 2, and it shows. Although, as you’ll see below, I was a little underwhelmed by the rather average character models, it is the locations that will really blow you away. Whether it’s snowy mountains (complete with a constant stream of fresh snow) or elsewhere, you’ll see sights that will leave you open-mouthed. Community – Whenever I’ve had trouble with a control or with a mission, there’s been someone willing to help. I’ve really never seen anything like it. Without asking, without even looking especially stuck, somebody would pop along to see if I needed help with something (editor: too many GM's or what?). Despite everything I say below, this is an MMO worth playing for the friendly people alone. Real Money MMO – Planet Calypso, like everything else in the Entropia Suite, allows you to both pay in and withdraw real money. This means two things: you can use real money to buy your way through the game, but you can also work towards withdrawing a profit. The idea of making money playing games is plastered all over the Entropia websites and that glimmer of hope is no doubt a big part of people playing this game. Blot on the Landscape – While there are some genuinely pretty locations, Planet Calypso also has some genuinely horrible looking graphics, mostly in regards to the character models. They look generally undetailed and a bit blocky, but on top of that the movement animations are pretty terrible as well. Point and Click – The control system is one of the very worst I’ve ever come across in an MMO. Most of the actions you will perform are set to a menu which opens with the right mouse button. This is a result of the game being a spin-off from the other Entropia planets – things less based on the MMORPG – but it ends up being pretty gamebreaking I think, if only because it means immersion is non-existent. Glitches Galore – Planet Calypso has crashed my system no less than three times, and I’m thinking people with lower end computers will really have a problem with this. Keep in mind that I play Metro, Crysis and more on at least almost their highest settings without issue. Add to that that sometimes missions can be a little wonky and you’re left wondering where things have gone wrong. I was sat in my vehicle when one of the crashes occurred and I haven’t had access to it since. Hmmm…. Planet Calypso is an MMORPG not built in an engine that can really handle an MMORPG. As a result, you end up playing something not unlike PlayStation Home, where you feel the developers have done a fairly good job putting a game together under the limitations of the system, but that those limitations don’t necessarily fit in a good game. The graphics are stunning at times, but the glitches you may face more than balance the good with the bad, and the story/quest system isn’t enough to keep you there. If you’re expecting to receive your first cheque after a few hours playing, you’ll also be sorely disappointed. Like everything, this is a real money economy where the house always wins. I was staying away from Massively Multiplayer Online games because I knew that they can eat a lot of your free time. But all that changed for me on Saturday November 13, 2010. I opened Yahoo, and there I saw it: “Gamer makes a cool half-million by selling virtual property;” an article about a gamer who bought a virtual asteroid in Planet Calypso in Entropia Universe for $100,000 real US dollars, and few years later sold it for $635,000 USD. Incredibly, he made a lot of money just by playing a game. 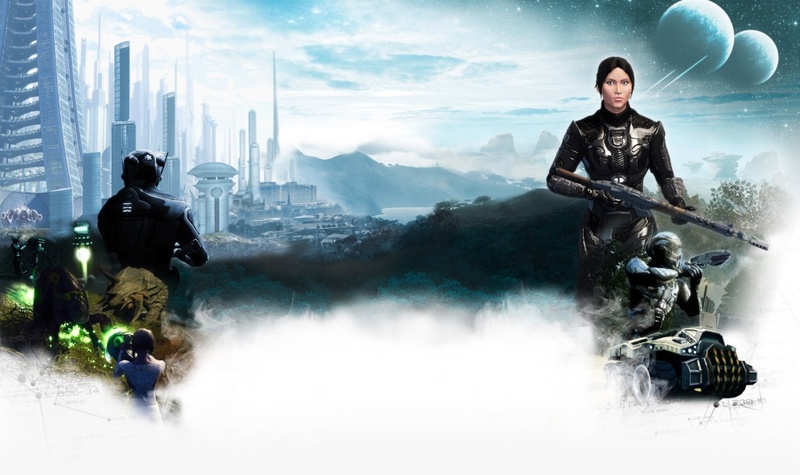 Entropia Universe is a virtual world with a real cash economy, meaning that every item in the game cost real money and you can sell it for real US dollars. My first reaction was “crazy rich people,” but I was curious enough to download the game later that day and create my virtual mini me. Virtual property, virtual money and making money sitting on your PC may seem strange to ‘normal’ people, but trading and making money in such a manner has been happening just like this for years. EU currency is known as Project Entropia Dollar, or PEDs, and just like currency in other virtual worlds, PEDs can be withdrawn from the game, converted to real world money, and deposited into a linked bank account. Entropia Universe is free to play (until you decide to deposit) with no monthly fee, so I elected to explore this new world right away. I was so impressed by the game that first day that I played until 3 a.m. the next morning, beginning in the starting area — an island where I had to complete a few missions designed to teach game play. This aspect of the game has been improved, but even at that time, it was enough to grab me. The graphics are powered by CryEngine 2, allowing for incredible realism, especially for a Massively Multiplayer Online game with huge areas to explore and thousands of people playing at the same time. While the beautiful landscapes are the first things that new players notice, the real reason I enjoy playing Entropia Universe month after month, year after year, is the complexity of the game and the freedom granted players to do whatever they want. Players can hunt creatures, kill robots, drive or fly vehicles, drill the ground for resources, manufacture armor and weapons, explore, even kill other players and loot them. There are four planets now and two more coming soon. So, with the space between them and the huge area to explore, it’s impossible to become bored. Moreover, professions within the game are an option — taxi driver, shop owner, hairstylist, medic, trader, or almost anything else that players create for the purpose of earning money within the game. If I had to choose just one word to describe Entropia Universe it will be “challenging.” While participating in games with monthly fees, there may not be as much concern regarding how a player interacts with the world; however, in EU bad decisions can potentially cost real money, or conversely, smart decisions can make real money. I believe that because everything is ultimately based upon real money, players are more mature and responsible than in other games that I have tried. My interest in the commerce within EU eventually led me to purchase two shops so I could begin to sell goods to other players, which has provided me with some valuable experience in money trading. As far as game-play, my personal record in lucrative achievements is a $40 USD Gazzurdite Stone from one hit on October 16, 2011, on Planet Arkadia. Incredibly, there are players who have been able to kill a creature or drill resources worth $20,000 USD. Other games set goals where high scores, like one millions points, or require certain achievements in order to gain rewards. In EU, my goal is to eventually acquire $20,000 USD and buy a car — maybe even become a headline in a Yahoo news article, like “another person gets rich playing video games.” Other personal long-term goals are: create a role-playing society where everyone can take a position; own property on every planet in the game; and be able to craft my own armor and weapons. I would encourage anyone who enjoys adventure, challenge, and online gaming to check out Entropia Universe. And keep reading the Metaverse Tribune — I’ll be providing updates and sharing my experiences here every week! but yourself and you also can't take the views of someone who luckily scored a 20k US dollar mining claim as they are both biased for different reasons. peds but you can also go nuts and spend a lot of money on things. Personally i couldnt stand the free way of playing for more than a month as the time it took to build peds was long and i could earn more by working some extra hours in real life for my EU play money. yourself and that is what i liked about EU... not everyone is a General or Maxxed level player.. infact hardly anyone is. big payout and if you avoid that way of playing and let what comes come naturally then you will enjoy yourself and the challenge of making it in EU. On the other side of the coin if you have lots of spare cash you can jump a few rungs of the ladder by being able to afford items out of the reach of many players, you would be astounded at the prices of some of the items believe me, some of the amounts are insane and out of control and everyone wants prices to fall but.. at the same time they hope they loot one of these ultra expensive items. Hope to see you soon in the game, give it a try and judge for yourself... i did. goodluck and say gday if you see me ingame if you end up trying it. Please feel free to add your review of entropia universe as a comment. I will start off by saying that entropia universe is a great game with super awesome graphics and wonderful community of players. I love the massive grand scale of the game and the fact that it has a real money economy is appealing to me. I have made many good friends on this game and have had really fun times playing it. I don't care for some of the aspects of it though, for instance the pirates and some of the big headed, money grubbing, arrogant bastards, the long time players or player I should say who acts really nice but then cons the newbs into doing their work for them by handing out free ammo and guns and then they reap rewards like winning motherships and then go try to rationalize it..stuff like that. the players who think they are better than other people...not going to say any names but they know who they are . Many of the players tend to develop what I call "Uber syndrome" because they have played for so long and feel as if they know everything and everyone else who is new is stupid in comparison... . There is however many cool people as well so choose your friends in the universe wisely. The money withdraw system needs improvements as well but the way it is setup is favoring the house so it does not surprise me that it is setup like that.The financial gains for one as mindark is known to hold money payments to players for "up to 40 business days" because they make money off the interest and to maintain money management as well. The money management is one thing but that is a poor excuse for situations like this, recently one of my friends and long time player tried to withdraw one small payment of only $100 after depositing over $1000 in his avatars career and mindark only commited to the payment after 40 business days and then told him he had some information about the routing numbers wrong when it was not wrong. They made him change the numbers then change them back again to the original numbers then they said because of the complications with the transfer they took 700 of the 1000 peds withdraw as a fee. So he ended up only receiving 300 peds worth of currency. There are many ways to have fun in this game but its not a game to play if you want to make money. Unless of course you are ok with putting tons of money into mindarks pocket and choose to purchase the virtual lands and other forms of investments such as shops or trading. But that brings up the traders offering low rates to low income players just trying to get by in the universe or just point blank ripping people off. You will find many people in the universe that are out to make a profit by any means possible. There are many people who will try to justify their actions anyway they can but they are just capitalist pigs and don't really care for the well being of anyone but themselves. The truth hurts and many will not want to view their enterprises in the universe in this light. But none the less this is how things are. Much like the real world where the rich get richer by exploiting the poor. That is how I see the entropia universe. A great game for fun but don't expect to get rich unless you treat it like a business. There is profit to be made. Just do it the right way and have fun. I first started playing Entropia Universe in 2004 when it was still called Project Entropia. I played until 2008 and quit for personal reasons. I missed playing EU and began playing again in October 2012. I have always liked this game for many reasons. It is very different from when I first played. One of my favorite things about EU has always been the community. If you know me ingame, you know that my primary profession is hunting with mindforce. This was not an option for a profession in the old days of PE, that is, unless you had loads of PED. One of the great things about this game is the diversity of professions available. I also like that you are not required to do missions. I like the freestyle play of the game. Another interesting trait of this game is the real cash economy. Which means you can make and lose money playing, but that's all part of the fun. This game can certainly be a money pit, but there is also a chance to make a profit, albeit rare. I'm not trying to profit from my game play, although I wouldn't mind if I did lol. I play purely for the fun of it. Overall, I do love this game and find it addictive at times.